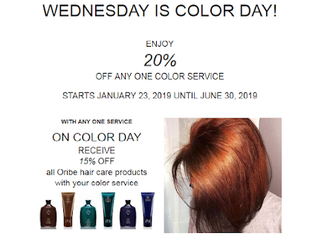 From January 23 to June 30, 2019, come to Blue - a complete hair salon - on Wednesdays and enjoy 20% off any one color service! blue a complete hair salon is a chic hair boutique located right in beautiful Lexington Center. We will customize the treatment to flatter your looks and enhance your hair. Our goal is to make you look great while being good to your hair. - For products, we use Goldwell color, whose ingredients are as gentle on hair as can be. - For process, we apply permanent color on the roots and color balancing on the rest of your hair, so your hair is as healthy and natural as possible, while stunningly good-looking! Our expert stylist team strives to deliver a look specific to your unique personality. Book a consultation today so that blue can help YOU look and feel your best! Winner Best of Boston 2002 for Hair Coloring!